Joyce Carlson started The Powell River Peak in October 1995. In addition to her newspaper career, Joyce has long been a volunteer for a variety of groups. For six years she chaired the Powell River Ayjoomixw Spirit of BC Community Committee. As a result of that she was chosen to carry the Olympic flame during the Torch Relay’s visit to Powell River in February 2010. Joyce has been a member of the Rotary Club of Powell River since 1995, serving as its president in 2002-2003. She is a member of Powell River Festival of Performing Arts committee, which Rotary sponsors. She is secretary/treasurer for Powell River Model Community for People with Disabilities. She was invited to join the board after serving as president of the Powell River 2007 BC Disability Games. Her newspaper career started as a stringer with The Powell River News in 1970. She worked as a lifestyles editor, sports editor, junior and senior reporter as well as editor before being named as assistant publisher in 1984. She was a union shop steward for 10 years. She became publisher in 1986. In 1989, she left Powell River to become publisher of the Gulf Islands Driftwood on Salt Spring Island. Joyce served on the BC and Yukon Community Newspaper Association board from 1986 to 2012 and was association president in 1989-90. 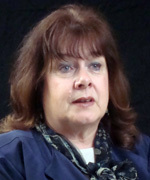 She was one of three BC representatives on the Canadian Community Newspaper Association for nine years and served as national president in 1994-95. In 2009, Joyce was one of 45 British Columbians honoured by the BC Achievement Foundation for her many community volunteer efforts. The awards were presented by Lieutenant Governor Steven Point and Premier Gordon Campbell at Government House in Victoria. Joyce married her high school sweetheart Don in 1964. Their family includes two sons, their two daughters-in-law and two grandsons and Bert, a West Highland terrier. Joyce Carlson, publisher, The Powell River Peak, talks about what makes her community unique and how The Peak aims to serve its community. Joyce Carlson, publisher, The Powell River Peak, explains some of the key operating changes her newspaper has undergone since its inception in 1995. Joyce Carlson, publisher, The Powell River Peak, comments on the major changes that may lie ahead for her newspaper and whether it will continue to circulate using newsprint for the foreseeable future. Joyce Carlson, publisher, The Powell River Peak, describes the history and impact of delivering the news digitally in her small coastal community. Joyce Carlson, publisher, The Powell River Peak, provides an overview of the sources of revenue that are utilized by The Peak in this era of greater competition and rapid change in the news delivery industry.